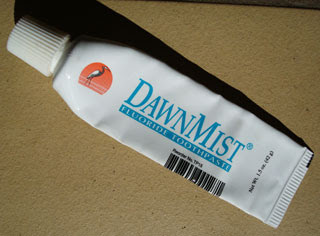 This is a very generic toothpaste made for Donovan Industries of Tampa, Florida - but it's made in China. I don't know where we got it. The size is kind of small, like what might be given to you in an amenities pack at a fancy hotel: 1.5 oz. It's basic mint - white and chalky. It's not smooth enough to really flow onto your toothbrush properly. The package designers were not ultra-professional; notice how the bar code is so prominent on the front.